I believe your J-6 is made in Korea, 1994. This is not MG-122. It is 1994 MG-821. Show Us Your Washburn / Re: Any hints, which model this one could be? General Discussion / Re: How to post a picture. This is how. This gets asked a lot. I have nothing to do with this listing. 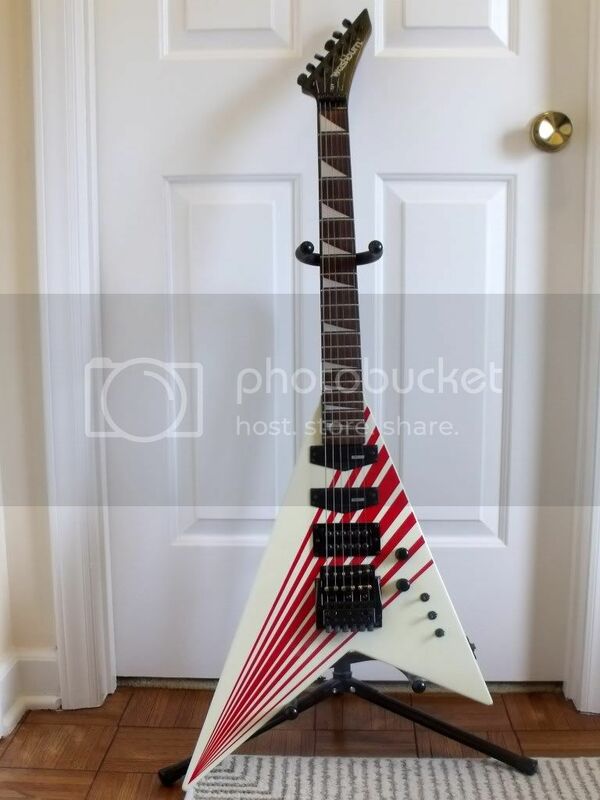 General Discussion on Washburn Electric Guitars / Re: what is this guitar NX6 with a floyd? shadows fall? Definitely not X-81 Face Eraser. My best guess would be one of a kind, custom order NX6. I have seen few of them out there with the floyd and couple of them with dot fret markers. I do not remember seeing any with pickups directly mounted (NX3 feature) but it would not be hard to imagine that someone wanted one that way. Serial number and Made In USA should be stamped at the back of the headstock. It could possibly be custom variation of X-81 Face Eraser, Jon Donais signature model. Description does not match ones I remember seeing but it could have been custom order. Upload picture to one of the hosting sites and then post IMG code here. Feel free to e-mail picture as well if that works better. Show Us Your Washburn / Re: Help to identify this, please. This is 1990 N2 model, first run for this series. Download 1990 catalog http://www.washburn.com/media/catalogs/pdf/Washburn1990Catalog.pdf you'll see it there on page 7. I believe blade pickup selector switch and tone knob were there in 1990 and 1991. 1992 model had single volume knob and toggle pickup selector switch. I'm pretty sure this is WR-150 model in Metallic Purple color. Based on serial, production year was 2000. This model was part of Washburn Rocker series, made between 1999 and 2001. According to 1994 Washburn catalog, this is MG-112 model. General Discussion on Washburn Electric Guitars / Re: Who the heck is Billy T ??? Billy T was named after Bill T. Atkins, otherwise known as Terry Atkins. Terry worked for Washburn Custom Shop since late '80s or early '90s. He was also Product Manager and as far as I know, he actually designed this model. Show Us Your Washburn / Re: Washburn G-2V questions. Several '80s models had Wonderbar on them. Few that come to mind: A-series, G-series, RR models, HM-20. Wonderbar alone sells very well on e-bay so you definitely got pretty good deal there.